This entry was posted in Uncategorized on April 25, 2016 by Joe Taylor. 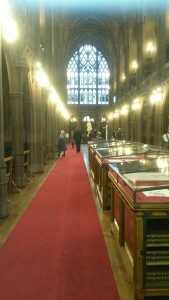 Those of you who read my tweets will have seen that I recently visited Manchester and among many other things visited the John Rylands Library, Deansgate. Rylands was a Victorian entrepreneur and philanthropist. 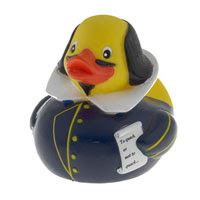 (I was sneaked in as ducks are not generally encouraged). His wife donated this to the people of Manchester on his death and it remains a fascinating homage to the people who developed printing and made it possible for working people to become educated. Well that’s my brief interpretation anyway, but go and have a look next time you’re in the area. Beautiful building full of beautiful things. This entry was posted in Uncategorized on April 7, 2016 by Joe Taylor.